For a true gourmet chocolate experience, you must try ultra-luxury French chocolates from zChocolat. 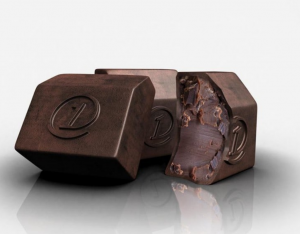 “zChocolat delivers what no other brand can – chocolate perfection with pure French savoir-faire,” according to their website. 26 chocolates, with 26 numbers and 26 recipes, all with one unique shape. Pictured here are #1, Mistral Breeze – A velvety Madagascar Bourbon-Vanilla ganache, infused with a hint of Provençale lavender, enveloped in 62% Venezuelan dark chocolate with an additional 70% cover; #20, Subtle Balance – A praliné made from Piedmont hazelnuts blended with a white chocolate and a vanilla ganache, all covered with rich 40% milk chocolate from West Africa; and #17, Coco Thrill – A sumptuous praliné made from Piedmont hazelnuts and a refined 40% Ivory Coast milk chocolate, accented by the enticing flavor of finely grated Sri Lankan coconut – all drenched in an intense 70% Venezuelan dark chocolate. 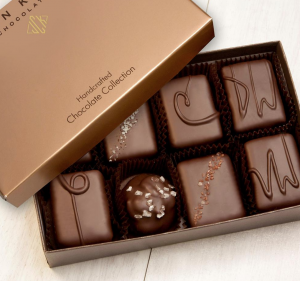 These divine gourmet chocolates from Matthews 1812 House are meant to be savored and offer a variety of smooth, nutty, and crispy candies covered in gourmet milk and dark chocolate. Shown here are Gourmet Assorted Chocolates, Chocolate Truffle Fudge Bars, and Milk and Dark Chocolate Toffee Assortment. Prettily packaged too. Dylan’s Candy Bar has some amazing gourmet chocolate selections to choose from! Shown here are the Belgian Chocolate-Covered Indulgence, the Gold Collection Bar – Madagascar Vanilla Bean Filled Milk Chocolate, and Chocolate-Covered Strawberries and Gourmet Chocolate Dipped Cookies.